Cheap non-stop flights from Spain to Mexico City from €399 return! Complete list of Airlines offering free hotel during layover! Cheap flights from London to Portland from £294 return! SkyTeam carrier AeroMexico has just released some great fares between Barcelona and Madrid and Mexico City! If you plan to visit this country next year this is awesome solution moreover based on direct service! You can book the cheapest non-stop flights from Barcelona and Madrid to Mexico City from €399 incl. all taxes and fees and onboard meals. Checked bag for extra fee. We are also adding another deals from main airports in Spain (Malaga, Bilbao) with Air France-KLM promotioin and a layover in Paris or Amsterdam. AeroMexico promo sale is available for travel dates Spain to Mexico City from 11th of September (From Madrid already from end of August) to 29th of November 2019. Based on date of your outbound flight from Barcelona or Madrid to Mexico. Max sta 1 month. You can book discounted flights with AeroMexico by 24th fo February. Below you will find our booking as well as few travel date samples on each of the routes. Need affordable hotel in Mexico book your accommodation via Booking.com or Hotels.com. If you have booked these cheap flights from Barcelona or Madrid to Mexico City you can also compare best prices for car rental in this destination via Rentalcars.com. 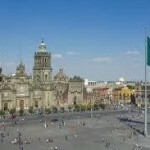 Booking sample of cheap non-stop flights from Spain to Mexico City from €399 return! In this case you would depart from Barcelona to capital of Mexico on 4th of October. Your return flight from this usually fairly expensive destination in North America back to Spain would be then on 17th of October 2019. Do not miss this promotion and book discounted flight tickets with SkyTeam carrier AeroMexico.